Tadah! and as if by magic the shopkeeper appeared. Well the CEO of the EA to be precise, who this week drew attention to the possibility of a water crisis in the UK in two decades time. but he really should have piped up some time ago. In his defence, the CEO of the EA will have relied on EA interpretation of data collected which has proved to be questionable on several occasions in recent years. If the CEO happens upon this, could he please make himself aware of the parable of the field known across the ages as Spring Bottom. It may not have an X or a Y axis, or sit on an excel spreadsheet, but for minds as simple as mine (and possibly his own) it remains a reliable belwether as to the level of the precious groundwater supply in this corner of the county. For the fifth winter in succession, Spring Bottom remains spring free. Groundwater levels in the region are in chronic decline because of the unsustainable way in which we use the groundwater resource. We do indeed need to be more water wise. A statement that first featured in this guff ten years ago, so come on Sir James Bevan, up your game. Phone ins and features on the radio and television following the CEO's declaration demonstrate that public awareness needs to be raised. Most VOX pops came back with the consensus that "it's always raining, what's he on about"
If the pay review hits choppy waters, I'd suggest raising the subject of a national water grid. Up your game Sir Jimmy B, Up your game. Like Mrs May, much of my week has been spent digging holes. Planting trees for my part. 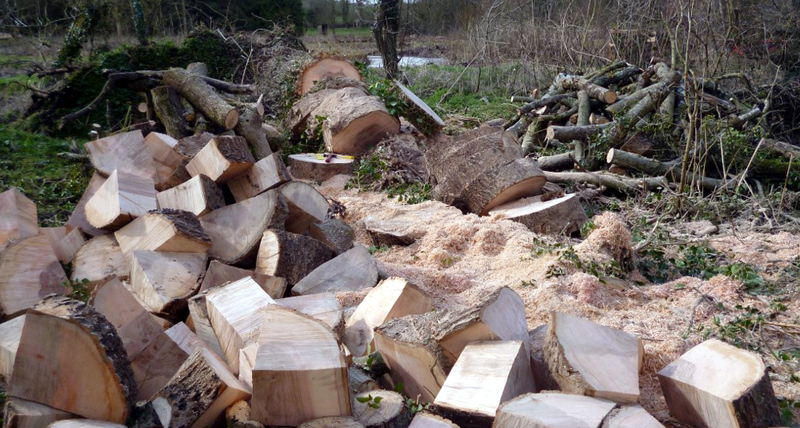 Native hardwoods to replace ash trees that will cash in their chips in the next ten years. Lord Ludg and myself have ridden hard on the splitter for many days and are confident that we now have enough logs lain about the place to serve several fires through next winter. The hydraulic log splitter is a piece of cutting edge technology to rival the space shuttle and the invention of the internet, but when will higher minds than ours develop the self stacking log? Phosphate levels in rivers and domestic water supply in our region are on the rise. Be it fertilizer, pesticide, weed killer or slug pellets, this kind of caper shouldn't be going on in close proximity to a water course. Buffer zones along river channels please Sir James, if you haven't gone home already. Another month, another front cover. 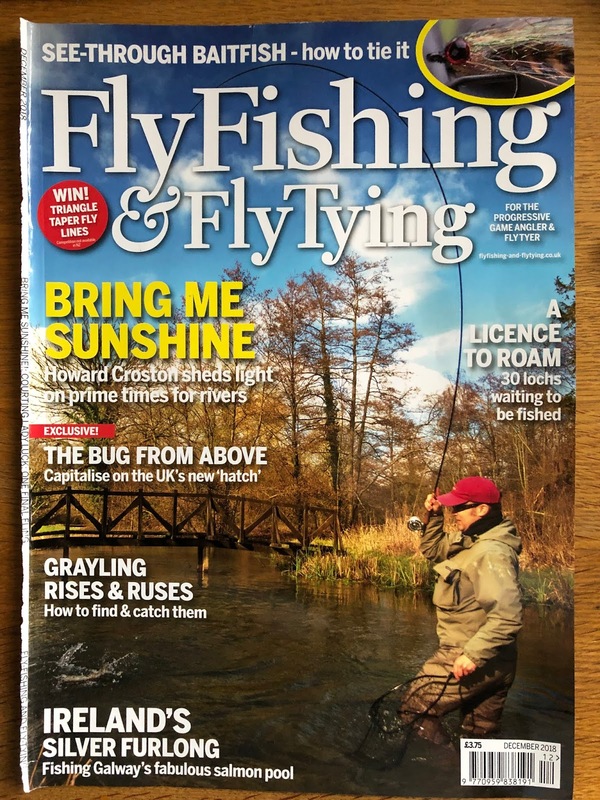 Here's the December issue of Fly Fishing and Fly Tying magazine. I'll own that I was a bit late to the piece, but as ever thanks to the clever person who took the photo for making the bridge that I built look level. The bridge has now appeared in quite a few publications and has subsequently been taken on by an agency for bookings with the requisite appearance fees. Today I spied grayling in pre spawning mode on the gravels above the ford across the mill stream. It's a spawning site of first choice for Thymallus thymallus most years, fingers crossed a few more join the party. Brown Trout are increasingly active and look up to the odd olive that popped in appearance this week. Since the implementation of the National Trout and Grayling Strategy in 2015 , a muddled piece of thinking in which brer grayling was largely ignored, we have been joined each winter by many large triploid brown trout. Our rods don't complain and most end up at the smoker such are their size, (the triploids not the rods - touch wood) they look great in the fishing book but add an unnatural air to this small stream. Despite being dismissed as a crank by supercilious knobs in fine fleece and cutting edge walking shoes, I maintain that introducing fingerling diploid brown trout in spring is preferable to an adult triploid only stocking regime in southern chalk streams. I've recently had the mantra tattooed on my arse, which will be premiered at the next consultation/achieve five eights of f&%* all, meeting. I seem to have got quite cross, which is worry and I lay the blame entirely at Sir James Bevan's door, but I recently attained the great age of forty one. A dispute seems to have arisen, so in the spirit of ontont cordial, I'll meet you half way. Recently I attained the great age of forty six. Gnashes teeth, clenches fists - F*&% You ED! I seem to have got quite sweary as well. I don't know how this happened, but it may be a sign of something else going on. My name is Chris de Cani and I am 51. By way of succour, Wikipedia teaches us that 51 is 3 lots of 17 and is the natural number following fifty and preceding 52, while our friends at Stagecoach have it as the bus route from Chichester to Selsey. It is the 6th Motzkin number and may be involved in atoms. Numerologists insist that the essence of 51 is its basic tone and vibration, with the use of the word "thus" very much to the fore in explanation. while my tape measure hints at a relationship between the numbers 20 and 129. Whatever, I've just turned 51. But before the guff, the pitch. Here's the site straddling the Test and Dever Valleys where an American owned company would like to build a bonfire twice the size of Winchester Cathedral. Visitors to this parish will be aware that I like a fire, but this is the mother of all incinerators with chimneys 90m high that generates electricity and dividends. It's called the Harewood Wheelabrator and it uses groundwater. Give it a google and make your own mind up as to whether it's a good addition to the Test and Dever valleys. Right on we go with another chunk of guff, and following the fire (see previous guff) the flood. Not the flood that would be manna for this valley, but the flood that flowed down my waders when I stumbled in the river and fell flat on my face in three feet of water. The experimentation with the cult of wild water swimming was swiftly brought to a conclusion and after a chilly tractor ride home I took an early lunch. I'll break off there, because Talksport's coverage of the recent Liverpool v Burnley game comes to mind. Three one in front, Liverpool were described as "going for the juggler". I've had an interest in football for some years. As a player I started off as a left winger and ended up at left back. Throughout my backward progression through the side, I don't think I ever pulled on the juggler's jersey. I refrained from faxing the show. DAB is a great thing and yes, the wide choice of channels, but goodness there's a lot of tosh uttered out there in commercial radio land. The grayling season is drawing to a close and it hasn't been great. There are undoubtedly fewer fish in the river and numbers of fish caught are down on previous winters. Yes the Otters and yes the Graculus, but spawning doesn't seem to have gone well two to three years ago. We still retain a reasonable head of sexually mature fish who currently assume an increasingly dark tone. Fingers crossed that they spawn well this spring and fry survival rates are good. This short film was taken six years ago in early April. I've not seen grayling spawning in numbers such as this in the Dever since. 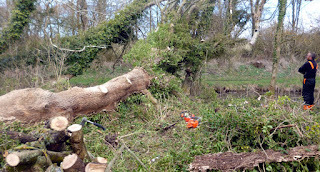 Storm Freya was an event and a big old ash cashed in its' chips on the island in the flight pond. Access wasn't easy and much of it was held up by surrounding trees so working out where weight lay and which limbs will fall which way troubled the grey matter a tad. Which is a conundrum I face most evenings when climbing into bed, so a plan was swiftly formed. Boats were briefly invoked, along with the requisite, levers fulcrums and bars, and four days later we have a heck of a heap of ash, cut in to lumps that must all be carried over the bridge by hand. That, or I build a bridge big enough to take the tractor. The Test and Itchen river report for 2018 dropped through the door the other day. There are many contributors including a chunk of guff from this parish and it serves as a reasonably reliable bellwether as to the current state of play in each of the river valleys. Those who have fished here will recognise the front cover, but rest assured that the river's flow has not been reversed or the bridge to the fishing hut moved. For whatever reason the picture editor flipped the picture around on the computer. 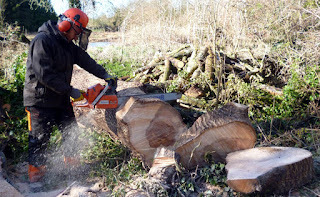 Emerging from work in the wood, we are having a few days replenishing the log store. The log splitter has been oiled and greased and put to work on piling up the logs for next winter. Through with Storm Freya we are currently on the cusp of Storm Granville (I think that's right, it definitely begins with a "G" it' seems to be how these things work) Yesterday it rained all day and today we had wind. The river is on the rise and water has appeared in the ditch half way up to the field known across the ages as "Spring Bottom" but we need a good bit more yet in a diminishing period of time. Ducks are pairing up and competition among drakes over which duck to set to partners with is fierce. Roe deer are particularly active and half a dozen switch from periods of sunning themselves under a sheltered hedge on the hill to feeding in the wood, with a couple of good bucks among them. are also in good nick, although Otis is shedding his winter coat. A heavy moulter, he is literally falling apart. Moss's training is going well and he has learnt to use the TV remote control. I popped home for a cup of tea the other afternoon and found him taking in the Champion Hurdle at Cheltenham. Does he have an online account with Ladbrokes? we don't know. A secret smart phone that he has kept from us? we don't know, but we've never had a dog like him. He has a passing interest in shooting and fishing, but we increasingly find him in front of a screen. A first world problem I know, but binge watching Crufts and the Cheltenham festival will not broaden his mind. We've pushed BBC4 and Sky Arts but he demonstrates no interest, it's the gee gees, the dogs or nothing. We have introduced "Parental Control" on access to The Racing Channel and At the Races, but can't keep up with the channels that screen "Police Dog Camera Action!" 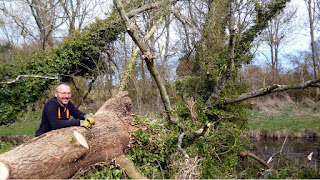 Back to work and the perennial skirmishes with the forces of crack willow continues. Mostly small stuff on the non fishing bank that is starting to inhibit weed growth, we've been dropping it into the river and pulling it out with the tractor to burn on the fishing bank. We experienced the warmest winter day on record recently and feeding a fire became a sweaty business. I had planned to burn the fen where we were working in a few weeks time, I try and do it every year as it produces a much thicker covering of flowers indigenous to a piece of fen in a chalk valley, principally hemp agrimony, meadow sweet and willow herb which are a magnet for buzzing bugs and butterflies. and within five minutes a wall of flame was making its way down the valley, and at this point I'll resume the diatribe regarding an urgent need for rain in these parts. I had completely underestimated how dry the ground was, and urged on by the merest of zephyrs, much of the fen was completely burned off. Which is great for the butterflies and all things that buzz, but because of the unplanned nature of the burn, I hadn't had a chance to thoroughly soak some fire breaks and a few hours later this resulted. Frank Zappa and the Mothers of Invention are in the Fishing Hut. The establishment pictured on the left is the Gambling House, while I play the part of both Funky Claude and Some Stupid with a Flare Gun. For the unallegorical, and fans of funk, the burned out shell is not the Fishing Hut. This is all that remains of the birch clad shelter by the old stew pond used to store fish food. It was on its last legs but didn't deserve to suffer this fate. The clay tile porch collapsed and yes, the hut did indeed die with an awful sound. Hissing mostly as red hot tiles pitched into the pond. It was my error of judgement to be burning willow on the riverbank, fortunately I am blessed with an understanding and forgiving employer. I didn't appreciate how dry the ground was, but who expects a barbecue ban in February? We need rain, lots of it. For the river, of course, but also to keep me from burning any more buildings down. Who will be our Stormbringer? In other Fire news, an application has been put in for a new "waste to energy via the medium of fire" facility on the other side of the Highway to the Sun. It's the mother of all incinerators that promises to provide power to a large part of Hampshire and it uses water, which is a worry for me. There are many in the area who spend their days in a permanent state of agitation. Foam an ever-present at the corner of the mouth, fists are clenched and teeth firmly gnashed. It seems to have been the default state for many throughout the past two to three years but it could be a long process for a decision to be taken on Wheelabrator Harewood which may call for a more measured and considered response. Unwelcome planning proposals regarding energy production and waste disposal have been made before in this parish, and have been rejected following a measured and considered response. Clearly I like a fire, but I don't believe the Wheelabrator is a suitable development for this valley. It is an industrial leviathan that will loom large on the local landscape and an inappropriate development for this parish. I will respond accordingly when invited to do so. Give Wheelabrator Harewood a google and draw your own conclusions. Please respond accordingly when invited to do so. Back on the bank, Tarka's back with a bang. When the snow fell there were no sign of any otters, other than a brief visit to our bottom boundary by a beast currently billeted on Bransbury Common. The trout fishery a mile upstream has suffered with a herd of Otters since Christmas. Seems that they are now extending their territory to visit us during the night - the otters, not the good people at the trout fishery. Apparently Bing was pipped for the warmest winter day on record this week. Buds began to swell, blossom broke and the Ceti's warbler rocked up. We've a dearth of geese on the upstream water meadow, which suggests that it isn't that cold somewhere else and there are many duck paired up. We've also plenty of roe deer about the place at the moment with a couple of quite senior bucks. Despite calculations of algorithmic proportions late last year, our supply of seasoned split logs is running low and the log splitter has been fired up. We got through quite a nit of wood when the snow lay on the ground, but a morning with the splitter produced a pile that should see us through the rest of the winter. Like a repentant Viking, I shall never lift an axe in anger again. 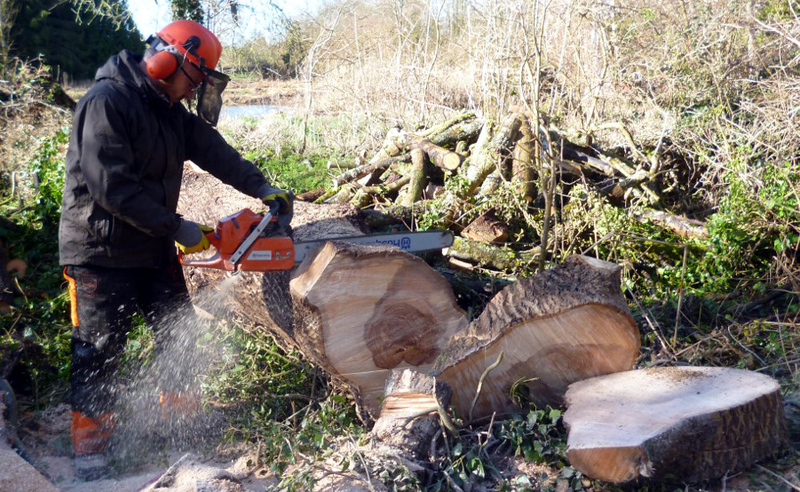 Hydraulic log splitters are the future of producing fuel for the fire. I do seem to have mentioned fire quite a lot in this post. Oh yes, nearly forgot. This book has just been published. George is someone that I bump into now and again when I am bumbling about on the short stretch of the Itchen that I fall in and out of. It has taken him ten years to produce this book and it provides a comprehensive "state of play" of the Itchen above Winchester in the early part of this century. George is a tenacious and talented photographer and the book features many examples of his best work and highlights the incredible biodiversity that exists in a chalk stream valley. It's an excellent and comprehensive tome that covers all aspects of chalk stream life and I commend it to the house. Hallo zusammen, Wie komme ich am besten zum Burg? Half term and we've been away again, so forgive the following the piece, as I have to write something down somewhere in order to remember where I have been. A visit to see Vienna this time, not Rigsby's cat, but the foreign capital city followed by a train trip to Salzburg for a few days. Austrian Airways by the way! Super service. Our early morning flight put us down mid morning in Vienna and we were punishing the wurst by 10.00 am. The Hofburg first, the enormous Royal Palace Complex, much of which was closed for cleaning. Unsurprising as they keep horses in the house. White ones famous for dancing, they were being readied for release as we passed. Never the biggest fans of Echo and The Bunnymen we eschewed the the prospect of Dancing Horses being brought on to continue our explorations. It's a grand old place is Vienna and occasionally has the feel of walking around among a series of giant wedding cakes. Impeccably clean and tidy, even the metro had a medical sterility about it. Out for dinner and the first of a few that I was unable to finish during our stay. A slow cooked beef dish with carrots, many little green dumplings, an unidentifiable red vegetable and a moniker that I forget but definitely trumpeted Austrian Independence in 1955. A substantial repast that could have fed a family of four. The Leopold museum to be precise, principally the work of Gustav Klimt and Egon Schiele. You can keep much of Schiele, he seems to have been a bit of an odd fecker, but Klimt has been a favourite for quite some time. When Madam moved into my student digs around thirty years ago my Jesus & Mary Chain Poster was replaced by a Gustav Klimt poster. The Smiths outside the Salford Lads Club was usurped by a poster of a work by a French impressionist whose name I forget. Klimt's Death and Life was a particular highlight and much bigger that I expected, as I thought he only painted pictures the size of posters. Here's one of Klimt with his cat, Vienna. Taken a few years after he painted Death and Life, he's the same age as me here. and were surprised to find an elaborate and efficient outdoor ice rink that included bridges, one way systems, skate police and roundabouts. before taking in this statue of Disco Stu. Goulash for dinner, a gargantuan portion in a Gasthaus with foaming jugs of beer and then to bed to make preparations for the two hour train trip to Salzburg. Austrian trains are good, very good! A two hour trip half way across Austria at many miles an hour in reserved seats with a superb internet connection cost 13Euros each. 13 Euros Southern Rail, 13 Euros. Upstairs on a train (It had an upstairs Southern Rail, another level) Is a great way to see the country. Snow started to appear and mountains hoved into view. We passed gargantuan piles of cut wood that would have Lord Ludg all of a slaver, snuggled the Danube for part of the way before moving into forest and small clear streams. A twenty minute walk from the station pitched us up at a cosy billet. A first floor apartment in an old building that had a front, two sides and a back wall formed from the local alp. Like every good Injun we headed for high ground to spy the land and caught the funicular up to the castle on top of the hill. There's a Noggin the Nog feel about the place and it's more of a small village than castle. The castle has witnessed much conflict in the thousand or so years that there have been fortifications on the hill. The torture room was particularly eerie, as the screams of the unfortunate soul having his toes tickled would have carried far across the whole town. Down the funicular and quite the surprise, a rushing channel of water. The Alm canal is one of the oldest subterranean aqueducts in Europe and was built to bring water from a wet region called Leopoldskron. It was completed in 1142, but is still in use today and carries water for several hydroelectric units that feed power into the city. It is drained once a year for maintenance work and tours for tourists, but unfortunately not during our stay. It empties into the river Salzach at several points in the centre of the city. quite shallow on its run through Salzburg and brim full of trout and grayling. I don't agree with this kind of caper and if any of our regular fisherman at Bransbury think it would be a good idea to attach numerous padlocks to a bridge that I have built over the Dever in the name of love, please be aware that our bridges are carefully engineered to cope with a variety of weather conditions and any additional weight added to a single side may send it seriously out of kilter. Wiener Schnitzel for dinner on our first night in Salzburg. A vast piece of battered veal that I just about managed to finish, the chips went untouched and we pondered eating from only the entree menu the following night. Mozart is a must in Salzburg. He was quite a guy from a very young age and has achieved cult status in these parts. The two houses in which he lived are well preserved and provided a comprehensive introduction into his life with his family in the town. There are musical pieces played by all of the family members and vignettes of opera pieces from The Magic Flute, Don Giovanni and much more besides. I particularly enjoyed an exchange of letters between Mozart's mother and a big noise in the Viennese music world who a young Mozart had been sent to study under. Concerns were aired over Amadeus's work ethic and how he could achieve so much more if he put a bit more effort in, in short he was just drifting through life. Well, well done Master Mozart, great drifting! Unfortunately we do not have a photographic record of our visit to either of Mozart's abodes. The factors are a tad precious over the reproduction of images of Mozart's chattels and with my idiot proof Nikon slung over my shoulder I was followed throughout our visit. Although they left Madam alone and she was able to sneak this shot of Mozart's mother. And then, all to soon, it was time to catch the train back to Vienna for our cheap flights back to Blighty. Two tremendous cities, we prepared for an arctic blast, but enjoyed a heat wave throughout our stay that brought the locals out sunbathing on the riverbank in the afternoon. Apologies again for travel guff but, as I said, I have to write something down in order to remember things. But not just yet, as we returned home on the Thursday in order to attend sporting events on the Saturday. Maisie's beau, Callum had kindly sourced some tickets for the Wales v England Six Nations game in Cardiff. We'd visited William (Child B) in Cardiff when six nations games had been on before and had an idea of what a big deal it could be, but this was something else. One of the best sporting events Madam or I have ever attended. Cardiff do rugby matches well, and ok the result went against Old Albion, but what a game. English and Welsh mixed up alike, I'll own that myself and the tremendous brace of welsh lads seated on my right had opened discussions on the course the remainder of the evening should take in order to bond further, but the lady on my left reminded me that I was of a certain vintage and ought to be making tracks. With the late kick off we had planned to stay the night somewhere and drive home the following morning. One night in a room in central Cardiff on match day comes in at a similar price to a high end washing machine, so we looked a little further afield, opting for a room a few minute's walk from Treforest Station south of Pontypridd and twenty minute ride into Cardiff Central. Stick your f$%£ chariot up your arse!" If you've an opportunity to watch international rugby in Cardiff, don't pass it up, it's one of the great sporting experiences. It was quite a half term.